Charleville SDE is involved in an iAim project targeted at increasing physical activity amongst students. We call it our Kilometre Club. The program runs each term and is a competition between our two houses – Kanyanna and Narungi. The amount of time students spend doing a physical activity directly correlates to a distance travelled of 1km (see above). Students send in their tally of physical exercise and the two houses race their way around a map of Australia which is displayed in our foyer. Along the way, individual students also receive certificates and ‘brag tags’ to encourage them to keep going. 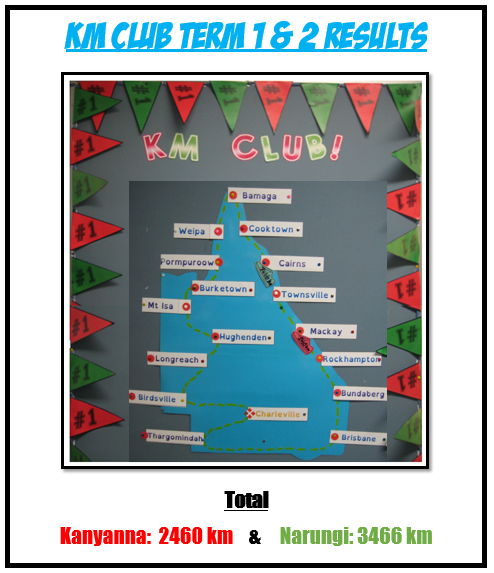 The team with the most points overall at the time of our Swim Muster in Term Four, wins the perennial KM Club trophy. Quite a number of our students get involved and we are often asked whether parents and Home Tutors are able to contribute towards the distance travelled too. It is a great way of getting our students up and moving!